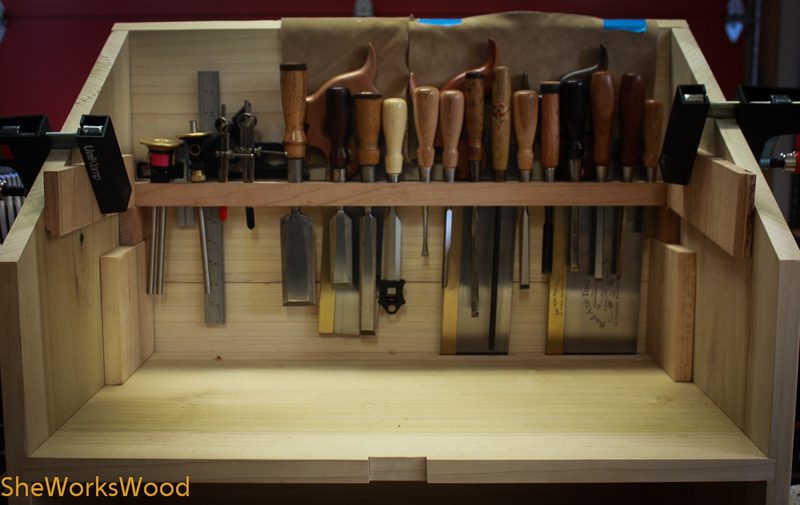 Today I got a little time to set up my tool rack in the back of the chest. I figured it’d be easier to do this before I put on the front. I’m also waiting for my hinges to show up, so it made sense to work on this now. It involved a lot of fiddling and fitting, but I finally got everything in. For the most part, I used Chris’ 1/2″ hole every 1 1/8″ rule on a 1″ thick stick. This would put all my chisel (bench and specialty) in one place which is preferable to the hither and yon set up that I have now. I’m not a matched set kinda gal so it looks a little messy, but oh well. After the rack is attached to the case, I’ll glue the suede to the back which will help keep the saw handles from getting scratched or rubbed. This entry was posted in Dutch Tool Chest, Uncategorized and tagged dut, tool rack. Bookmark the permalink. You’ve been a busy girl this weekend. Is that a Bad Axe saw? Do you like it better than Lie Nielsen’s? There is another maker out there I found this week, I’ll have to find the link and send it to you, he has some awesome saw’s. You know, Bad Axe sells saws that have size small handles for my dainty little hand. 😉 I’ve never actually used a Lie Nielsen. All my saws are Bad Axe or Wenzloff saws. Both are awesome. Clearly your standard for messy is higher than most. I can’t tell from the pics, did you make it wider than 12in? Yes, if I had to do it again, I’d make it a full 2 1/2″ wide and get a bit more space between the saw handles and the chisel handles. You don’t think it looks messy, huh. Goodie! I Really like what you have done. This is a very efficient design. I know Chris built his to transport but it seems like it would be very heavy. I’d be interested to know how much yours weighs fully loaded. I think he said his weighs about 130 lbs loaded. That’s not really easily transportable for me by myself. But he’s also hauling 10′ Robou oak benches in an out of his basement (Oy!). I expect mine to weigh the same or more cuz I’m using popular (not pine). If I take mine some where, it probably won’t be fully loaded. I’ll try and do a weigh in at fully loaded, but I doubt I’ll be able to lift it by myself. Mine will mostly roll around in my garage. Know I’m late to the thread so hope you see this. How did you attach the rack to the chest?? I used screws and glue.